Duarte Truck Accident Personal Injury & Wrongful Death Lawyers - Over 40 Years of Personal Injury & Wrongful Death Experience You Can Trust! Need Assistance With Truck Accident, Car Accident Or Other Personal Injury or Wrongful Death Accident Claims in Duarte, Calif? Truck, car and other injury accidents are never expected. But if you were unfortunately involved or are the family member of someone killed due to the carelessness or negligence of another with a wrongful death claim and are looking for an expert, experienced and trustworthy personal injury lawyer in Duarte, Los Angeles or anywhere else in California, that you truly can count on, then look no further! We are experienced personal injury and truck accident injury & wrongful death accident attorneys who work towards preserving your rights and obtaining maximum money compensation for your physical damages, as well as for emotional, loss of income and other financial losses. Visit our Truck Injury Accident Web Site to learn more about the truck accident injury claims process. Call us at 866 INJURY 2 or 818-222-3400 for a FREE case evaluation about your own specific truck accident or any other personal injury claim. With our personal injury & wrongful death lawyers there is NO charge for a consultation and there is NO fee on accident injury cases until you WIN! There are many time and procedural rules, especially DMV rules and insurance policy requirements, so please do NOT wait. Our truck accident case evaluation is FREE so there is no reason to wait and risk damaging your personal injury or wrongful death accident claim. Please contact us now. It is easy and FREE! 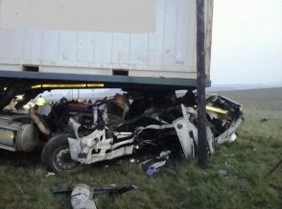 Large-size trucks or semi-trucks traveling at high speed can often result in a devastating crash or accident with debilitating injuries or even fatalities. Negligent truck drivers may be inattentive (e.g., texting or tired while driving) and rash in their truck handling in order to meet a time deadline. This careless and neglectful behavior has been proven catastrophic for the small vehicle passengers, especially car, motorcycle and bicycle motorists. Our truck accident personal injury & wrongful death lawyers are compassionate yet aggressive. They will help you understand your truck accident injury claims, wrongful death accident claims or lawsuits. Our personal injury & wrongful death lawyers and law firm hold tremendous experience in resolving personal injuries and wrongful death cases in Duarte, Los Angeles, the San Fernando Valley, Riverside, San Bernardino and other places in California. Bounded by the city of Irwindale to the south and the San Gabriel Mountains to the north, Duarte is located on the historic U.S. Route 66 and holds an annual Salute to Route 66 Parade every third weekend of September. Duarte has a population of about 21,800, according to the 2010 U.S. Census. Some notable personalities from Duarte include professional baseball player Bell Melton, jazz musician Glenn Miller, and actor Cary-Hiroyuki Tagawa. Reasons Behind Truck Fatalities in Duarte, Calif. Accidents involving trucks, large commercial vehicles and big rig vehicles in Duarte, California are quite disastrous. Truck crashes are often much worse than small car collisions or accidents because of the large size, weight and force of a truck. Thus, a truck collision personal injury victim can have extremely serious injuries, sometimes resulting in a wrongful death claim. Despite highly trained professionals who have extensive knowledge and experience in truck handling, fatal collisions and accidents continue to occur. This is primarily due to the truck driver’s negligence (including texting and fatigue) or at times poor maintenance or faulty design by the truck manufacturing company. We have over 40 years experience in successfully resolving thousands of truck accident, car accident, uninsured motorist (UM), pedestrian and other motor vehicle accident personal injury claims, premise liability claims and wrongful death claims in Duarte, Los Angeles and all of California. We work on a contingency fee basis: There is NO fee until you WIN and we offer an absolutely FREE CONSULTATION! There is NO reason to wait and risk losing your claim due to time deadlines and procedural rules of the DMV and/or insurance companies. Please contact us now.